I have a great book to share today, and also please stay tuned afterwards for the winner of Phyllis’s Fun Photo Contest and a fun announcement! Brief Synopsis: Four dogs are good friends. Each one has a job. Rose herds sheep. Izzy visits sick people. Frieda guards the farm. But what is Lenore’s job? Links To Resources: This book could prompt a wonderful discussion about what kids are interested in and what they are good at; about how different people (just like different dogs) are good at different things. Talk about all the many jobs there are, (here’s a link to a job index for kids in grade K-5) and ask kids what they’d like to be when they grow up. Have them draw a picture of themselves doing the job of their dreams, or write a short story in which they get to do that job. What kinds of jobs can they do now? At home or in the classroom, make a job or chore chart and let each child have a task they enjoy and can do well. Here’s a site where kids can “try out” different jobs KidsWork! Okay everyone, have a great weekend! Oh! You want to know who won Phyllis’s Fun Photo Contest and what the fun announcement was? Congratulations, Cathy! Please email me and we’ll discuss your prize, because I know you already have a signed copy of PHYLLIS. A second prize for Phyllis’s Contest, consisting mostly of fame but I’m sure we can come up with something to go along with the fame, is being given at Phyllis’s insistence, and that one goes to ROBYN! Really, it requires dedication to come up with a video of a tiny paper action figure winning a horse race. So Robyn, kudos to you too and we’ll talk prizes privately! And a huge thank you thank you and round of applause to everyone who took the time to color and cut and photograph and provide us all with such wonderful entertainment! You are all the greatest! … but now it’s available in GERMAN! Alrighty! That’s all the fun and games for today, folks! PPBF bloggers, please add your post-specific links to the list below so we can all come visit you! Oh Susanna – How Do You Know What Books Are Already Published In The Picture Book Market? Rescue dogs are the best. And border collies well–our Bambi and Molly were both super. THey taught me a lot. Mr. Katz writes book for adults which I've read. I want to look for this one, thanks Susanna! Congrats on the additional publication! I'm waiting for Julie R-Z to pronounce it for us or maybe a video reading? We're a dog family. We'll have to pick this one up. I also want to see how the story and photos blend. Congrats to Cathy & Robyn. It was so much fun seeing where Phyllis made it to this time! I love the sounds of your PB pick, Susanna. We own a rescue dog who is an amazing companion to our family. Her name is Jewel and she is that. “The Dogs of Bedlam Farm” – definitely gonna have to read that one! I've been reading lots of “rescue” dog books and next month I fear my blog is going to go to the dogs. And congratulations on the newest translation! This is one of my favorite books! I am a big John Katz fan! The Mom Person reads me all his books. He has a special connection with the dog brain. He and his dogs are my heroes. Especially Lenore! And how exciting about your book in different languages. How cool is that! Congrats, Cathy…and Susanna! What fun to have your book published in more than one language. I love the name, “Bedlam Farm”…sounds like those dogs are hard workers. Thanks for sharing your pick! I love to see your books in other languages! They look so cool. You must be really proud and sort of in shock. It's a BIG deal. Congrats. I love the book you have chosen this week, Susanna, and I will look right now to see if our library has a copy. And you know how highly I think of books be available in other languages. I have just added my book, but I am so sorry I should have checked beforehand, as I have just seen that Dar already reviewed it, so I am afraid it is getting a double dose of love. We've always liked photo books, true stories and any book about dogs. Great lookin' pick. Congratulations to Cathy and Robyn and all the participants – what fun! Congratulations, Susanna, on the German translated book. That's neat. Maybe it'll come to Korea. However, I wouldn't be able to read it in Korean. And congrats to the winners of your contests! Congratulations, Cathy! And Robyn! Woohoo!!! 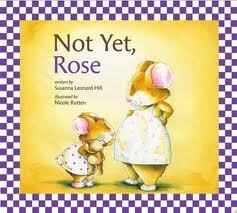 And I'm delighted that German kids are going to get to know the lovely story of “Not Yet, Rose.” I love that book. Your choice today sounds wonderful. You need your crayons and pencils and other art supplies for my PPBF pick — come on over and color!!! Sorry, my computer tricked me into pressing submit again – really, it is still laughing about pulling my finger! Susanna, loved your choice of books today — and I like they are based on a true story. I reminded me of my own dog and the routine he follows when I let him outside. I love observing animal behavior. I may just have to get this book — think my adult daughter would like it. 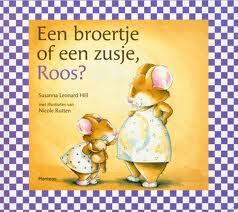 Congratulations Susanna for having your books published internationally. How exciting! And congratulations to Cathy and Robyn!. Fun entries. Congratulations all around! Susanna, how awesome about your book. :) And congrats to Cathy and Robyn…and EVERYONE…the entries were fun and creative and I know Phyllis really appreciated them! Well, you know I'm going to read this book 'cause it's all about dogs! Love it! Congratulations on your book being out in German, Susanna!! And congrats also to Cathy and Robyn for winning the photo contest! I love the book you picked for this week! We had a farm dog that was probably a border collie/old-time collie mix (she died at the age of 4; we're still heartbroken). I'm on a farm dog e-list and this book sounds like some of the stories I read on there (but this book is better written…LOL!). 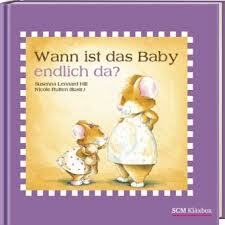 Congrats are in order- to you for your German edition of Not Yet Rose, and to Cathy and Robyn. Yay! And the Meet the Dogs..book looks lovely! Cathy, winner of the photo contest, and unable to comment on my blog 😦 asked me to please convey her utmost heartfelt thanks to all those who visited her blog, read about Phyllis' adventures in Patriot Fan land, and voted for her dive into the nuts! She is most especially appreciative of all the comments on her post and says that it is a lovely feeling to know one is not just shouting out into the ether when blogging! Congratulations, Susanna! Your book in German too? Exciting! You are really trotting the globe. And Congrats to Cathy and Robyn for their funny pictures! Phyllis in a bowl of nuts was so funny, I wished I thought of that! And Robyn, you are ham- love it! And the dog book looks like a wonderful read. 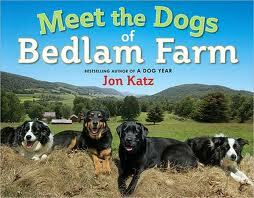 My kids would probably love the book, Meet the Dogs of Bedlam Farm! That's right up their alley. They love lots of stuff, but that would definitely interest them! Hope you have a great weekend, Susanna! Seriously, every time I stop by your blog I find a book that I MUST add to my collection, but a book on a farm with values and career extension options woven in? Perfection! Thank you, thank you. You know, I haven't read his books for adults, Wendy, but now that I've seen this one I want to! I have a friend who is a vet and she raises and trains Border Collies and they are lovely smart dogs! Aw, thanks so much, Kimberley. It is truly wonderful – I really love it (even though I can't read them :)) and I am proud and grateful! Thanks so much for your congrats, Jarm! And yes, this is a special book – a little different, and I like that!